stone is using Smore newsletters to spread the word online. Natural Selection: The principal that, among the range of inherited trait variation, those that lead to incresed reproduction and survival will most likely be passed on to suceeding geneations. (aka survival of the fittest). Ex. Giraffes ver their lifetimes have gotten longer necks so that they could reach the food on taller trees. This is an exaqmple because they Giraffes needed to adapt to the much taller trees so that they could reach the food in order to survive. 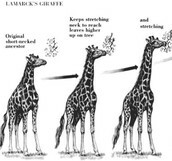 A giraffe with a much smallwer neck would have limited resources and would have a much harder time of surviving than one with a longer neck. 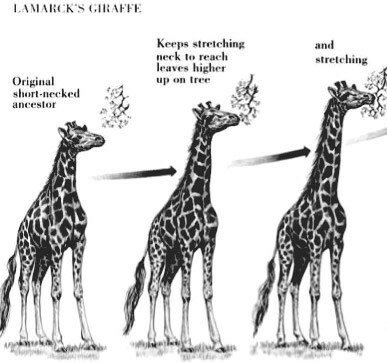 This is a picture of a giraffes neck as it evolves over the years its neck gets longer that way he can reach the food on the trees. Molecular Genetics: The subfield of Biology that studies the molecular structure and functions of genes. These are controlled by your DNA: a complex molecule that contains genetic information which makes up the body. Ex: A child will inherit certain traits handed down from the parents chromosomes. Parent Influences on Development: the formative nurture that conspires with nature begins at conception, with the prenatal environment. Parent nutrients and early development including being in the womb and early life lead to a certain development. Cultural Influences on development: how somebody develops due to their cultural background. Culture: the behaviors, ideas, attitudes, values, and traditions shared by a group of people and transmitted from one generation to the next. Primates use survival techniques handed down from past generations. Gender development is our assumed characteristics as a male or female can determine how we progress, develop, and fit in. In most ways both sexes have similar adaptive challenges but in some cases that is not always true. In surveys men admit to more aggression that women. Aggression: the physical or verbal behavior intended to hurt someone or something.